In June of 1883, the administrator of the estate of George Arlt, deceased, reported to the Probate Court for the County of Presque Isle, Michigan, that he had been successful in selling a piece of property belonging to the deceased. Like just about every probate file on the face of the earth, this file tells stories. She didn’t have an easy time of it, that widow. She was a second wife, with three very young children of her own at the time of her husband’s death (the probate file says the youngest were four years, two years and two months old in 1880 when George died), and with five older stepchildren. The estate went through three administrators before it was settled. But what particularly caught The Legal Genealogist‘s eye in this file was part of the land description when this 160-acre tract was sold. Hmmm… Primary School Land … wazzat? 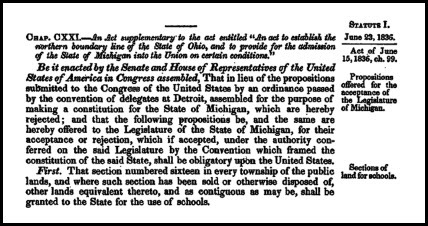 In other words, federal aid to education began in 1785: the proceeds of the sale of part of federal public lands were dedicated to the support of public education — and the part that was to be used for education was Section 16 of each township surveyed. And that’s how it came to be that the State Land Office had 160 acres of section 16 in Township 34 north Range 5 east to designate as Primary School Land and to sell it to George Arlt in 1871. Federal public lands, yes, but dedicated to the State … for primary schools. That Section 14 sounds like it is saying that the schools are expected to teach or at least promote religion. By Federal law. How does that get interpreted the way you folks do it today that any organization that supports religion is not allowed on school property? Was Section 14 repealed or just declared moot? Israel, that statute predated the Constitution and its separation of church and state. And even today it isn’t the law that organizations that support religion aren’t allowed on school property. What’s intended is that there be no establishment of religion and no “excessive entanglement” in the words of the Supreme Court. I knew about the section set aside for the schools, but what piqued my curiosity was why the widow had to bid on it at all…why did she not inherit it or part of it? And secondly…how is it that the land was sold to a private individual in the first place instead of being used for a school as intended? Or were they raising money to support another school already established perhaps? I guess that last question would not be answered by the estate’s court file in any case. Under Michigan law at the time, the widow was not in line to inherit real property. It went in equal shares to the children, and she received only a life estate only if there were no surviving children. The land itself wasn’t supposed to be used for a school; the lands in Section 16 were all sold, and the purchase money put into a fund to support the schools.